ASP’s commuter mug will not only keep hot drinks hot and cold drinks cold, but it lists all the major meteor showers visible in both the Northern and Southern hemisphere. The commuter mug also comes with educational literature describing what meteor showers are and how to observe them. This 14 oz. 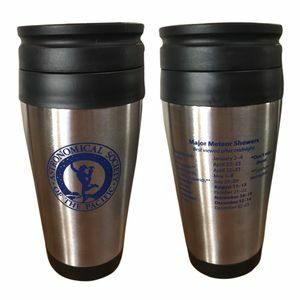 stainless steel tumbler has a plastic interior and removable lid & thumb slide closure. The cup is perfect for your favorite hot or cold beverages, and has a tapered bottom that fits most beverage consoles including autos, golf carts & boats.